Being Sunday, nothing was open in Antofagasta, so we had some breakfast in a bar - the only place we found open. Having filled our stomachs on a steak, cheese and egg sandwich - unlike the locals we decided not to drink red wine at 9:00 in the morning -, we filled the Weasel with diesel and headed out of town, continuing our journey south. 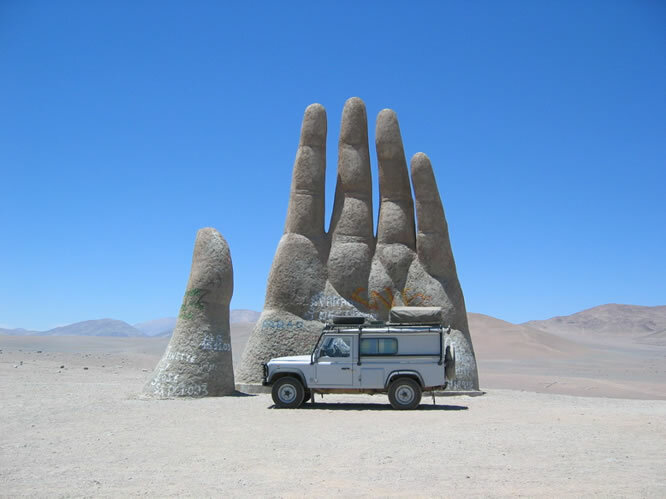 About 45km south of Antofagasta if you look to the right you can see the famous stone hand - the Mano del Desierto - rising out of the desert. It was built in 1992 by a local sculptor, Mario Irrarrazaval. If you are in your own car, you can pull off the road and drive right up to it. It is a great sight from afar, but unfortunately as you approach it you can't miss the tons of graffiti all over it. Even sticking the Weasel in front of the hand for a photo didn't hide the annoying writing. After a few minutes another car arrived and we moved out of the way. Having ranted for a while about people who insist on spraying their names on monuments, we couldn't believe it when four guys got out of the van and promptly took out a roller and paint and started painting their name on the hand. 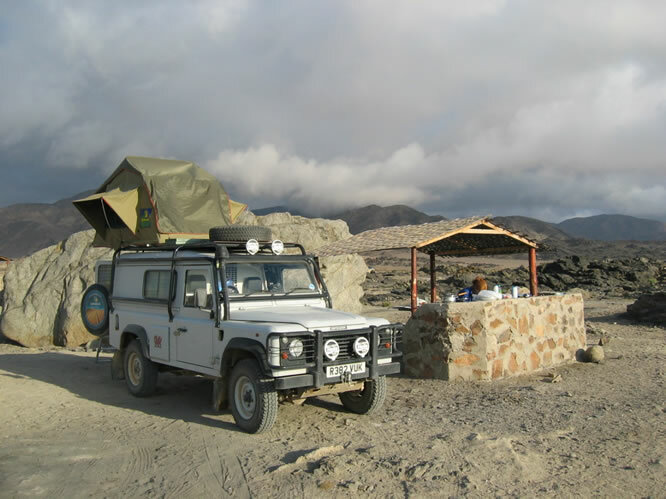 We continued heading south, intending to camp up for the night in the Parque Nacional Pan de Azucar. The park covers almost 44,000 hectares of coastal desert and cordillera, and is home to more than 20 species of cacti and succulents and lots of birdlife. The road leading into the park is off the Panamerican, about 45km north of Chanaral, and is a fairly rough gravel track. 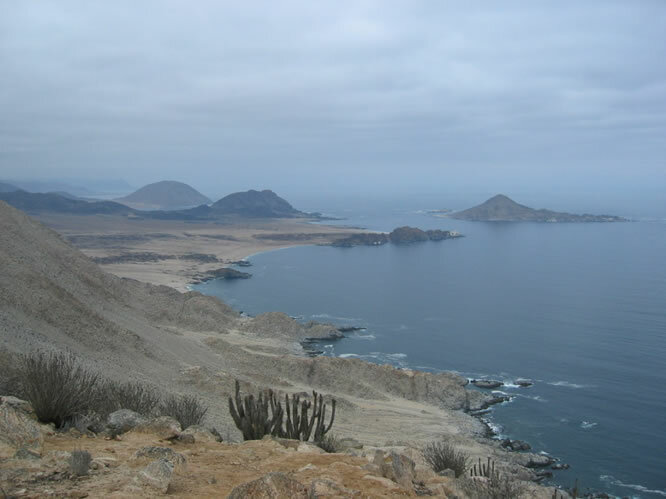 We soon arrived at the sea and picked our campsite right on the sea's edge at Playa Piqueros. It's a great place to camp with toilets, showers, covered picnic tables and drinking water supplied by the ranger. We cooked up some food and enjoyed the sunset before heading for bed. When we woke in the morning we discovered we had had a visitor in the night; the remains of the chicken carcass we had left in the firepit after dinner had disappeared, probably taken by a fox. We drove to the mirador at the top of the park and enjoyed the views of the Pan de Azucar island, before getting back on the road south to Santiago. En route, you pass the Santuario de la Naturleza Granito Orbicular, a "geological oddity" according to our guidebook with irregularly shaped mineral conglomerates. We followed the short track leading up to it and for the life of us could not work out where we were supposed to look. Next stop was Copiapó to stock up on empanadas from "Empanadopolis" which bakes a huge variety of empanadas, cooked for you fresh there and then, and then headed out to Chañarcillo, a former silver mining town, now a ghost town. Intrigued by the description in our guidebook, we came off the Panamericana onto a very dusty and rough road, expecting to see a number of stone and adobe ruins of the old jail, bank, theatre etc with foxes scurrying about looking for scraps of food. Instead, all we found were numerous piles of rubble and stone and it was impossible to make out any of the former buildings. Disappointed with the wasted journey, we headed back towards the main road only to get a puncture halfway along. Our first puncture of the whole trip. Luckily it didn't take Ed long to get us back on the road and we finally called it a night when we reached Vallenar. It can be easy to miss this town completely as the Huasco Bridge does not drop down into the town, merely bypassing it. You need to take the Vallenar-Huasco highway leading into town. After driving around for a bit we found a really friendly, family run hostel - Hotel Viña del Mar - which had secure parking around the corner, for just £12 a night. 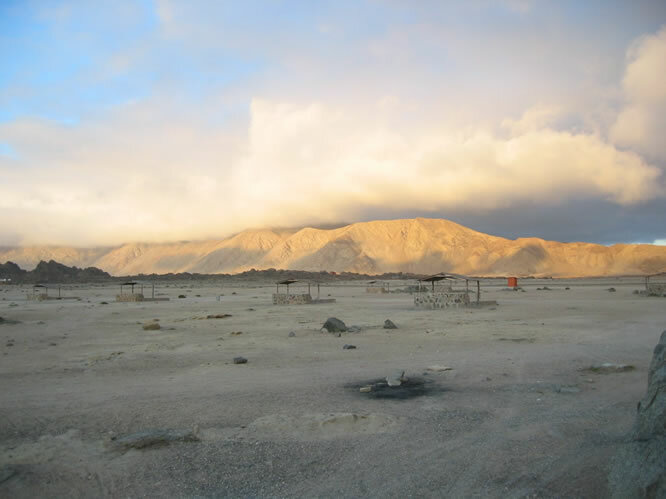 We were now 190km north of La Serena and two day's drive from Santiago.